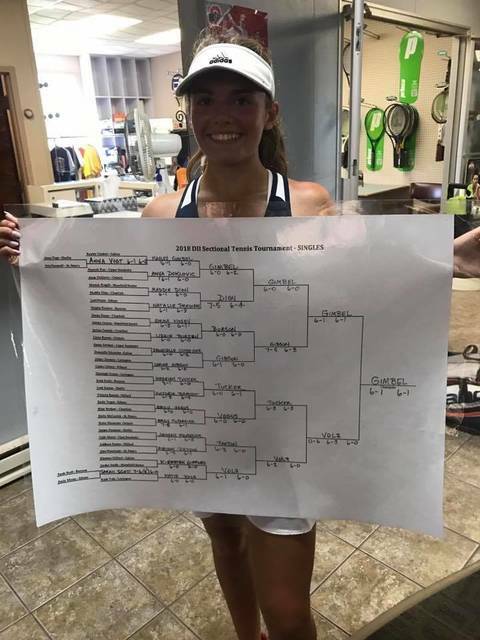 Submitted photo Galion singles standout Kayley Gimbel poses with the sectional singles bracket after claiming the title over Lexington’s Katie Volz on Saturday. Gimbel, joined by teammates Katherine Talbott and Jalyn Oswald, will represent the Lady Tigers in the district tourney starting Thursday at Bowling Green State University. SHELBY — The Galion Lady Tigers tennis representatives won three matches each on Thursday at the Shelby sectional tournament to secure a spot at districts this week. On Saturday, Kayley Gimbel, Jalyn Oswald and Katherine Talbott headed back to Shelby to play for sectional championship honors and district seeding against tough competition. Gimbel played her semifinals match against Carlee Gibson from Willard and appeared to have no issues, cruising to a 6-1, 6-0 victory to advance to the championship match. In the finals, Gimbel would face a member of the Lexington squad as the second semifinals pairing contained two Lady Lex members. Hayleigh Tucker advanced to meet teammate Katie Volz on Saturday. Volz defeated her teammate despite dropping the first set; 0-6, 6-3, 6-0. With a sectional title on the line, Gimbel bested Volz in straight sets; 6-1, 6-1 to claim the championship and the number one seed at districts at Bowling Green State University starting on Thursday, October 11. Katherine Talbott and Jalyn Oswald were seeded as the number two doubles team entering the sectionals in Shelby. After winning their three matches last Thursday, they met up with Addie Slone and Jo Brubaker from Willard on Saturday in the first of two semifinals pairings. Talbott and Oswald advanced to the finals as they downed the Lady Flashes in three sets; 6-4, 1-6, 6-2. Their opponent would be the number one seeded tandem of Sylvia Goldsmith and Gracie Pfeifer of Lexington. Goldsmith and Pfeiffer claimed their championship match spot with a victory over Mariah and Jayla Medina of Edison. Lady Lex would defeat the Galion duo 6-0, 6-0 to claim the title and hand Talbott and Oswald a runner-up finish and a second seed heading into districts at BGSU. https://www.galioninquirer.com/wp-content/uploads/sites/38/2018/10/web1_Kayley-Champion.jpgSubmitted photo Galion singles standout Kayley Gimbel poses with the sectional singles bracket after claiming the title over Lexington’s Katie Volz on Saturday. Gimbel, joined by teammates Katherine Talbott and Jalyn Oswald, will represent the Lady Tigers in the district tourney starting Thursday at Bowling Green State University.